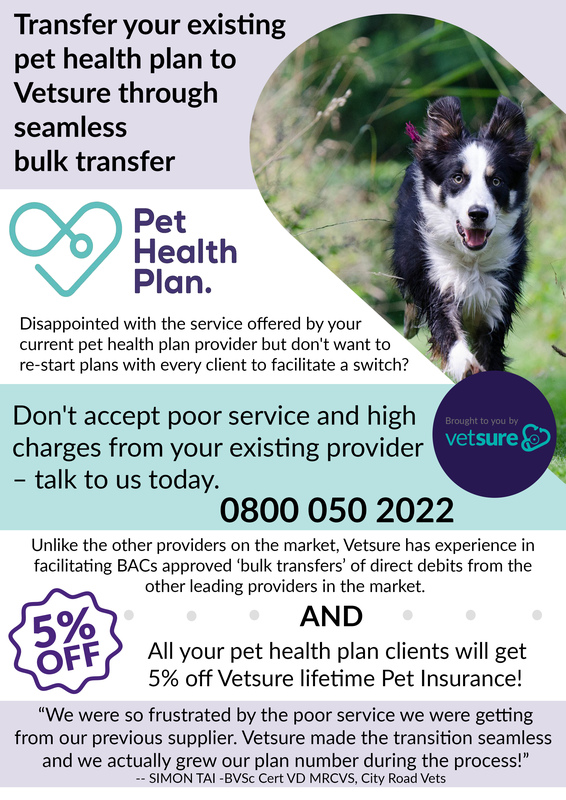 Vetsure are the first Pet Health Plan supplier to implement the bulk change process. As from the 1st January 2018 all reputable direct debit collection companies (Facilities Management Providers) are obliged to agree to bulk transfer of existing clients without penalty. You can now move your existing pet health plans to Vetsure without having to cancel and re-start direct debits with every member, making transferring members quick and easy. Vetsure have successfully transferred plans over from Denplan, The Animal Healthcare Company, Simply Health and Lloyd & Whyte. We are confident that the same can be done with any other provider. Vetsure has a growing network since the launch of our Pet Health Plan, whether transferring from another supplier, or starting from scratch. The Vetsure ethos is to link prevention with cure. Pet owners who are keeping their pets healthy with a pet health plan are also rewarded with discounts on Vetsure Pet Insurance premiums. Find out more about the Vetsure Pet Health Plan by reading our article here or visit our website here. Contact us if you are thinking about setting up a Pet Health Plan or if you would like to transfer your plans over from another supplier.